Here's my card for the current sketch at CAS(e) this Sketch. I combined the sketch with this month's Reverse Confetti "Stock Your Stash" theme, which is hello/just because cards. Since it's summer, I decided to go with a beachy themed design featuring RC's Seaside stamp set. The set's whale is my focal image. I used my MISTI to stamp the image so I could easily double stamp the image for nice, solid coverage. The image was cut out with the matching die and embellished with a teeny, tiny self-adhesive pearl as an eye. 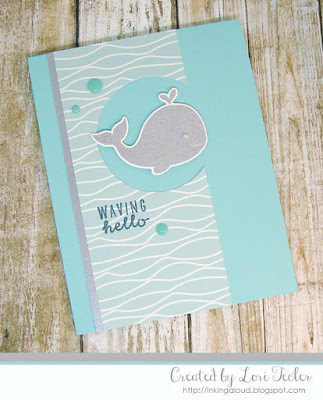 To go with the whale, I found some wavy patterned paper from RC's Forever My Love paper pad. After using one of the Pop Up Circle dies to cut a partial circle from the patterned panel, I edged it with a narrow strip of shimmery silver paper, then adhered it to an Iced Aqua card base. The whale was positioned in the cut out space, using foam tape for dimension. The set's "waving hello" sentiment was stamped beneath the round opening in navy pigment ink. 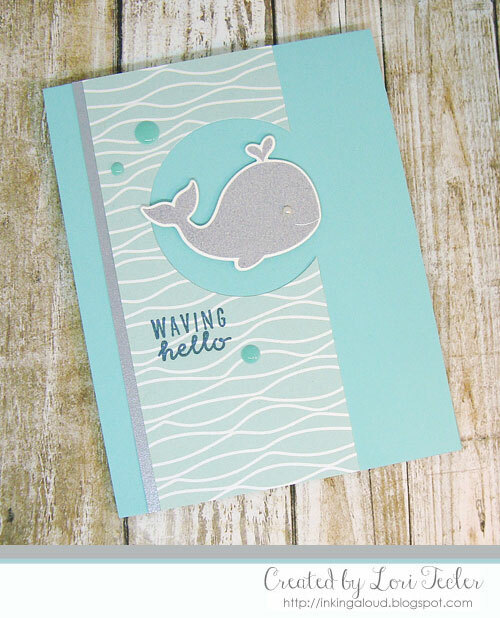 I accented the die cut space with a trio of aqua enamel dots to complete the design.